How You Think and Perceive Stress Response of Body and Mind could be Either Helpful or Against You! On 6th June 2016, I was driving from New Delhi to Meerut. It was a nearby town. As it was a busy highway, with lot of surprises from villagers and local people, I found, rather felt, the rising rate of heart beat and blood pressure, especially during overtake. This was a clear feeling of stress response in body. However, my mind worked like an observer and also felt the gradual normalizing of the beats and blood pressure. In the evening, before going to bed, I felt like watching something instead of reading. I happened to watch this YouTube video casually…and it was also about stress. The common perspective toward Stress is to regard it as an enemy, as counter productive and as one of the contributing or triggering factors in most chronic disorders. Kelly shared about a study where more than 30 thousand people were tracked for over 8 years. The large percentage of people who died due to stress as a factor were those who believed that stress is harmful or bad. Then, there had been a test about social stress where the teacher discourages with verbal and normal cues while one is attempting the simple math test. It was just to give an idea about Stress Response. Increased Breathing Rate leads to more oxygen and energy. Focus on making it deep and avoid making it shallow. Raised Heart Rate: consider it when you feel courageous or joyous or positively excited. It is the same feeling. Constricted blood vessels that results from stress response need to be relaxed as this condition is harmful over long period of time. Consider the Stress Response as helping to overcome or prepare for the challenge. Oxytocin encourages hugging, social instincts, physical contact, to seek and provide support and help. Simply speaking, Oxytocin is all about going out for providing support or for seeking support. It develops Stress Resilience. Another research also supports this perspective that people who consider Stress not as bad or harmful are less likely to die from increased stressful events. You will get better with stress and trust yourself to handle challenges well. The last minute was a marvellous insight. If you have to choose between stressful situation and a comfortable one, choose the one that provides greater meaning to you life, even if it is not comfortable or poses stress. I have been meditating for over two, almost three decades now. The number one positive change that you experience with meditation is increased self-awareness, the ability to stand aloof and as an observer to your thoughts, feelings, emotions and behaviors. It is okay for anybody to occasionally be overwhelmed by challenges or stressful events. Self-awareness helps you to stand apart and observe the stress response. The second tool should be breathing. You can consciously make it deep and rhythmic. Always avoid shallow breathing as it will make you more stressful. Abdominal breathing is very helpful. The third tool should be your thought. Perhaps, you could find that if you start to be anxious, it is not good to start with thoughts first. An anxious mind is not easy to guide or suggest to. Focus on breathing and it will soon sets the physiology and mindset to a more optimum condition where your thoughts and positive suggestions will carry more weight. If you find yourself stressed, feeling nervousness, having low mood or poor sleep and less energy, you will definitely will get a great boost in all aspects of mind health with Ayurvedic herbs. 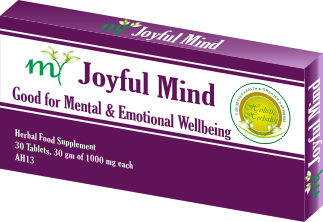 You should try My Joyful Mind – the herbal supplement with blend of great Ayurveda herbs for boosting mind health.